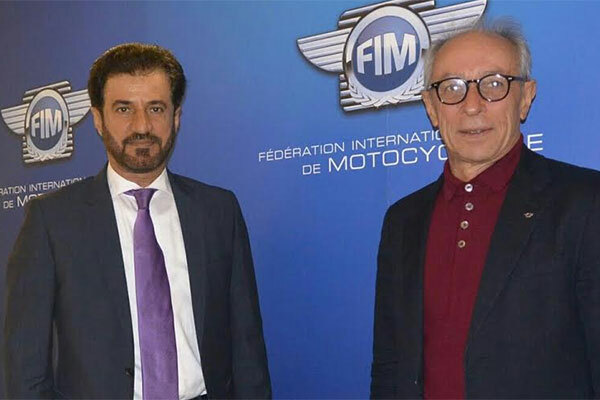 The e-learning platform developed by the Automobile and Touring Club of the UAE (ATCUAE) to allow motor sport officials to upgrade their skills on a range of courses is a valuable initiative, said the president of motorsport body FIM. Mohammed Ben Sulayem, president of the ATCUAE and the Emirates Motorsport Federation, recently wide ranging talks on the development of motor sport in the Middle East with FIA president Jean Todt and FIM president Vito Ippolito. High on the agenda during last week’s meeting in Geneva were the launch of the Formula 4 Championship in the Emirates, as well as the FIA World Cup for Cross Country Rallies for cars and the FIM Cross Country Rallies World Championship for bikes and quads, which both feature next month’s Abu Dhabi Desert Challenge, organised by the ATCUAE. Todt praised the UAE for the major development it has witnessed in the field of motor sport, both in terms of its organisation and management of global events, and in attracting prominent sporting events aimed at developing young talent. Ippolito expressed his admiration for the world’s first E-learning platform for global motor sport which was launched by Sheikh Nahyan bin Mubarak Al Nahyan, Chairman of the General Authority for Youth and Sports Welfare, last November. "Launching this highly specialised learning project, which is considered to be the first of its kind in the world, is a valuable initiative that allows all those involved in the field of motor sport to have access to a certified source of knowledge which can be accessed from anywhere in the world, " said Ippolito. Sulayem stressed that the shift towards e-learning is a step forward in line with global trends in education, indicating that motor sport today has its own special curriculum that needs to be studied extensively to enable effective organisation and management of events that comply with the highest safety standards. The E-learning project for global motor sport is the result of an initiative by Sulayem. The ATCUAE has been working since 2012 to provide training for sports officials in 20 countries covering the Middle East and North Africa, Asia, Europe and South America. The training and educational services have included 2,500 volunteers divided among 29 diverse training programmes that are offered in seven different languages. The club has also trained 1,000 volunteers in the field of motor sport in the Emirates every year during its participation in the F1 Etihad Airways Abu Dhabi Grand Prix, as well other motor sport events hosted by the UAE. The first three training programmes put forward by the club in recent years received an overwhelming response from trainees. They included "Psychological First Aid", a programme designed to support the psychological needs of volunteer officials, "Media Crisis Communication" and "Critical Incident Management for Chief Medical Officers.